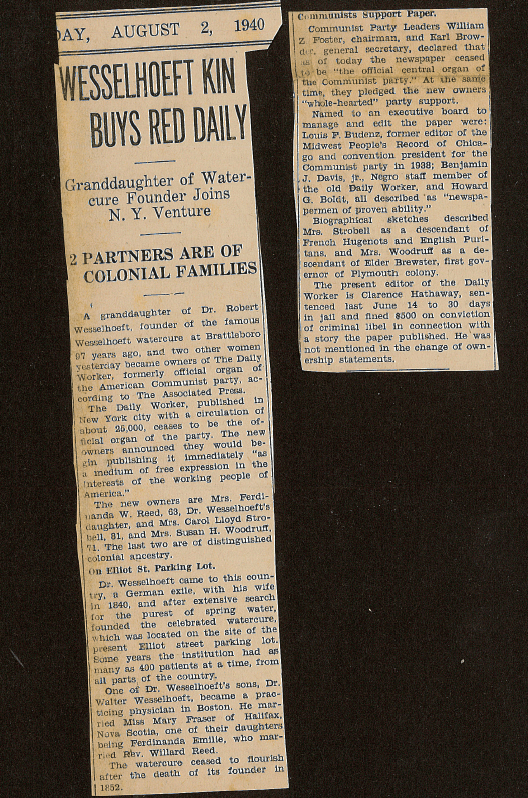 In the August 2, 1940, Vermont Phoenix, an article titled “Wesselhoeft Kin Buys Red Daily,” reported that Mrs. Ferdinanda W. Reed, 63, who is the granddaughter of the Water-Cure founder, Robert Wesselhoeft, along with two other women, purchased the American Communist newspaper, The Daily Worker, which at the time had a circulation of 25,000. The article goes on to state the Communist Party leaders, William Z. Foster, chairman, and Earl Browder, general secretary, noted that “…as of today, the newspaper ceased to be the official central organ of The Communist party.” However, they also pledged to Ms. Reed and the other owners, “whole-hearted ” party support. These are interesting and contradictory statements. The other two owners were Mrs. Carol Lloyd Strobel, 81, and Mrs. Susan H. Woodruff, 71, who were both descended from “distinguished Colonial ancestry.” Strobel was a descendant from the French Hugenots and English Puritans , and Woodruff was a direct descendant of Elder Brewster, the first governor of the Plymouth Colony. How did these three ladies run The Daily Worker in the coming years? Ferdinanda Wesselhoeft was born in Halifax, Nova Scotia, on 10 February 1870. This is according to an emergency passport which was issued in Berlin, Prussia on 10 September 1889 when Ferdinanda was 19 and had gone abroad to study for two years. (See U.S. Passport Applications, 1795-1925, Ancestry.com, citing National Archives and Records Administration, NARA Series: Emergency Passport Applications (Issued Abroad), 1877-1907; Roll #: 33; Volume 058:Germany. According to Massachusetts Marriage Records 1840-1915, accessed Ancestry.com, Ms. Ferdinanda (Wesselhoeft) Reed was married at the age of 26 to Mr. Willard Reed on 28 March 1896 in Cambridge, Massachusetts. The marriage record states that her father was Walter Wesselhoeft, the son of Robert Wesselhoeft, and mother was Maria Fraser. Ferdinanda traveled frequently during her life. 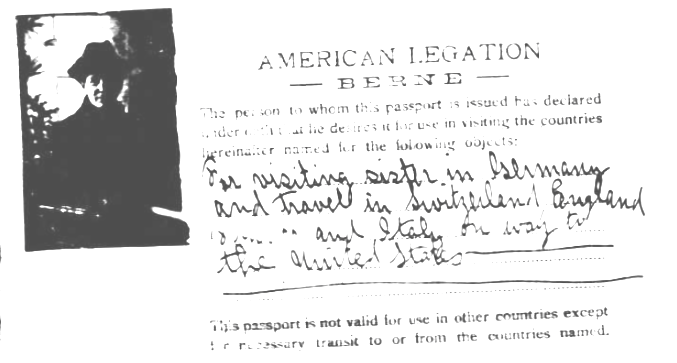 On 12 February 1915 she went to Berne, Switzerland to visit a sister, which included side journeys to England and Italy, and made several more trips overseas. A passport photo is available in the Ancestry.com database of U.S. Passport Applications, 1795-1925. She was 45 years old when this photo was taken. See image below. Ferdinanda (Wesselhoeft) Reed, taken at age 45, passport photo. The Boston Herald, Monday, 4 December 1916, featured a photo of her and an article on her candidacy for the Cambridge school committee. The article mentions that she was for eight years the director of the Avon School for Destitute Children, and has been active in the neighborhood association for the Peabody School. Ferdinanda died 10 February 1952, in Santa Barbara, California, 82 years from the day of her birth. A quick search of the Santa Barbara Genealogical Society Local Records database yielded an obituary in the Santa Barbara Obituary Scrapbook, p 13, which was instantaneously fulfilled by Society volunteer Helen K Rydell. My eternal thanks.